Cut the pork fillet into strips. Heat the oil in a large frying pan, add the curry paste and stir over a medium heat for 1-2 minutes. Add the pork strips and cook over a high heat for 2-3 minutes or until the pork is lightly browned. Add the coconut milk and courgettes, bring to the boil and simmer for 4-5 minutes or until the courgettes and pork are cooked. Season the broth with fish sauce and palm sugar then stir in the coriander. Cook the rice noodles according to packet instructions. 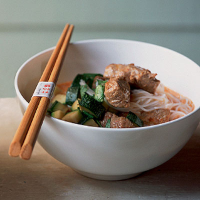 Divide the noodles between 4 deep bowls and spoon the pork and coconut sauce over the top.